The current generation is extremely used to popping pills for every minor illness. Medications can cause more harm than benefit if used incautiously. It is truly said that excess of anything is harmful, and thus justification is important before consuming strong medications like Tylenol or aspirin. Aspirin and Tylenol are both analgesics (painkillers) but their mode of action is a very different. Aspirin acts by inhibiting prostaglandins (hormones which produce pain signals) but it acts locally and stops production of pain signals. 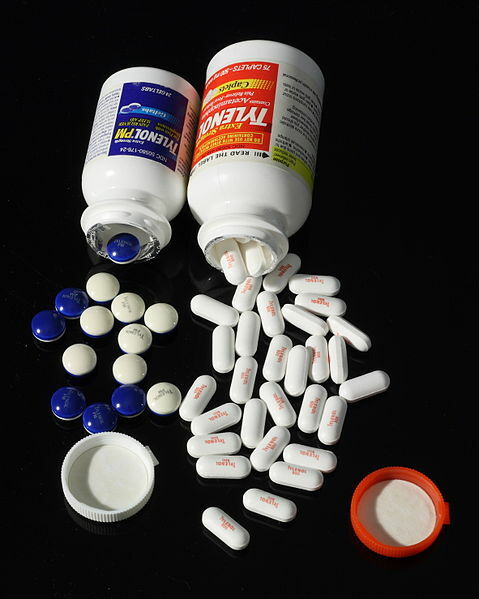 Tylenol is also called as paracetamol and contains acetaminophen. Paracetamol is also a prostaglandin-inhibitor but it inhibits the cyclo-oxygenase enzyme. It thus controls pain by controlling the signals before they reach the brain. Aspirin has anti-platelet properties in low doses but has anti-inflammatory properties in high doses. Paracetamol is a very strong anti-pyretic, which means it helps bring down fever, but aspirin is a weak one. Aspirin is used in treating collagen disorders like rheumatoid arthritis, osteoarthritis, spondyloarthropathy as an anti-inflammatory drug to control inflammation and thus, reduces fever and pain of joints. Due to its anti-thrombotic property (prevents formation of lumps of blood in the blood vessels) it is used in cases of patients having undergone cardiac angioplasty and bypass. In the case of angioplasty, a new stent is placed inside a blocked artery of the heart. To prevent clogging of the newly placed stent, low dose aspirin is given to patients indefinitely. It also prevents coronary heart disease if taken daily in low doses on a daily basis. Aspirin is used in case of colo-rectal cancer, as it reduces the chances of cancer if taken regularly for 2 years. Further, it is used in ischaemic stroke and transient ischaemic attacks (TIA) patients that occur due to blood clotting. Earlier, aspirin was given in patients to reduce fever but it posed a threat in children of producing Reye’s syndrome (disease in which there is brain and liver disorder). This danger has lead to drastic reduction in the use of aspirin for controlling fevers. Paracetamol or Tylenol is a very powerful analgesic. The pain-controlling properties are so strong that it can be used to control pain post-operation and in cancer patients of terminal stage. Paracetamol has very weak anti-inflammatory properties and if it is used for rheumatoid patients, it will only control pain mildly and the underlying immune reactions will continue to worsen. Paracetamol is better tolerated in patients with excessive gastric (stomach) acid secretion than aspirin, which erodes the gastric lining to cause gastric ulcer. There are plenty of adverse effects to both aspirin and Tylenol. The side effects common to both are liver disorders, but they are particularly common in case of paracetamol. Other side effects are angiooedema (swelling of face and lips), disorientation, pruritic rash (urticaria), gastric hemorrhage (bleeding in stomach) and thrombocytopenia (reduced platelets). Side effects of aspirin are bronchospasm (spasm of lung airways), gastric ulceration and gastric bleeding. One absolute contraindication of aspirin is a bleeding gastric ulcer, as it will further aggravate the bleeding. Aspirin is more commonly used as a long-term preventive drug in heart patients, whereas Tylenol is limited to acute conditions to relieve pain and fever. Tylenol and aspirin, though used for a lot of complaints, can prove fatal if used without consulting a doctor. rachita. "Difference between tylenol (paracetamol) and aspirin." DifferenceBetween.net. April 8, 2019 < http://www.differencebetween.net/science/health/drugs-health/difference-between-tylenol-paracetamol-and-aspirin/ >.